If you have a fake USB flash drive that have CION RW8021 AR19 chip controller .Download CION AP192 production tool and format corrupted CION RW8021 flash disk . Hello my friends , Many of us buy USB flash drives from Online markets like Ebay ,Alipapa ,Amazon or any website .Some of sellers are deceitful , they sell as example 8GB flash drive then you find later that is only 2GB .They sell fake flash drives and user can't determine weather it's original or fake .They make the same cover of famous flash drive brand names such as Kingston , Kingmax,Transcend ,Sandisk,Sony and other famous USB sticks . You will see a big difference if you open the cover of your fake flash drive , inside you will not see a processor , you will see only SD card connected with the flash board circuit .Now we will explain how to fix fake flash CION RW8021 AR192 . 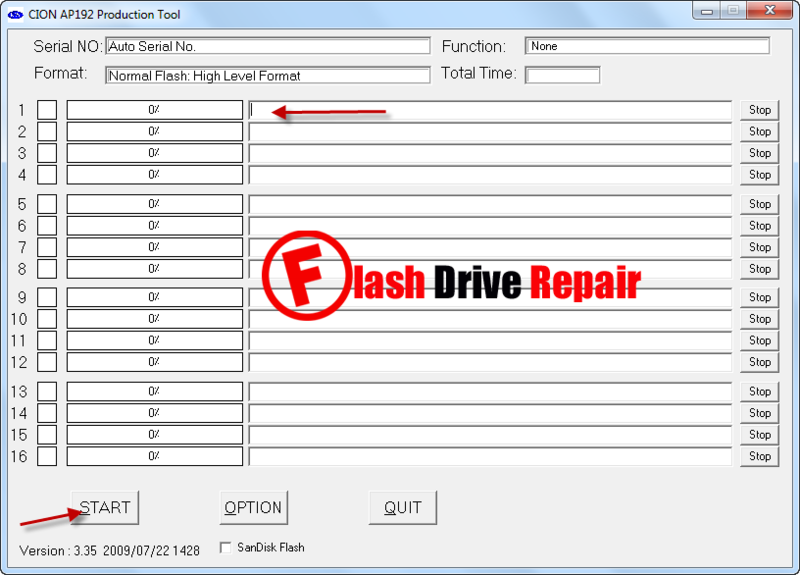 The flash drive repair software for fixing fake flash CION RW8021 is CION AP192 production utilityV3.35.CION AP192 production tool is designed to format and repair Fake flash that have Cion RW8021 chip controller .CION AP192 format tool will update your flash drive firmware . Download CION AP192 production tool V3.35 from the download links in the bottom of this article . Insert fake flash disk to your PC . Open RW8021 ptool v3.35_En then click on Start . Wait until finish formatting your fake flash drive .